I bought ainex TL-015 [special precision tool set of 32]. This driver handle is hollow and it is difficult to attach a bit. If you turn it on, it slips down to the back, so you have to level it. 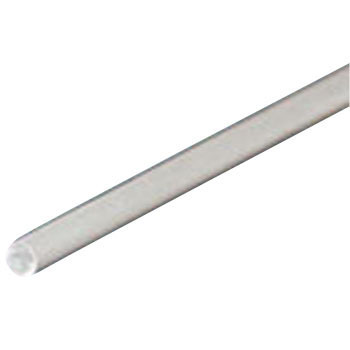 Therefore, I thought that I would cut an aluminum round bar into a suitable length to fill the hollow. It went well, and even if it turned up, the aluminum rod was stuck and it didn't fall in the back, so the work efficiency increased. Dare, speaking of the request, the round bar of aluminum does not need as much as 1000 mm, so most of it has left. Well, I think it can be used for anything. It would be appreciated if you could sell it in smaller units. This review is about item#40356486. I am very happy, I hope to ask again. . . This review is about item#40356495. The position of the rearview mirror of the auto three-wheeler I was riding recently was not good enough and rebuilt the stay. Cut to about 400mm, screw on one side, bend and complete mirror stay. The back is much easier to see. This review is about item#40356531. I am an amateur but easy to work with. This review is about item#40356513. This review is about item#40356547. It was used as a core rod of a bearing with an inner diameter of 12 mm. Packing was polite and likable. It fits nicely into a bearing with an inner diameter of 12 mm. This review is about item#40356565. Because it was aluminum, I did not expect much strength, but when it was 1000 mm or so, I could not withstand my weight and it was distorted. This review is about item#40356504. I purchased φ10. It is easy to process hardness. Machine with lathes and machining, transform into superb parts you want. This review is about item#40356556. Cut the material, drill it and use it. Because the material is aluminum, it is handy because it is easier to process and it is also strong against rust, and it is useful because it does not want to sell at the home center etc. It is easy to choose various sizes. The finish is also beautiful. This review is about item#40356522. Moderate hardness and easy to process. I delivered without curving with polite packaging. It was a bit uneasy as I wrote that it was crooked in the review, but it arrived smoothly, and the aluminum bar itself did not have any problems either. I was glad to ask you. The strength of the shipping box was too low, the goods crooked and arrived. Once you bend it will not be straight. Please send it out with a box with a little strength. I bought it for the first time, but it is perfect for my purpose of use and it is very useful. I used it for prototype of change link of bike. Although originally planned to produce with stainless steel, we adopted aluminum material which can be easily processed even for amateurs for trial production. At the home center, there was not much material of hope, even if there was expensive, it took days to order, and considering the labor such as movement, I thought that choosing materials is limited to monotaro. It was cheap but it was a product with sufficient precision. I want to use it again if necessary. Even if the bolt is Torx bolt, since it has no meaning if it was squeezed with a nut, I bought a nut that I can not loosen with a wrench. It was better for φ12 mm to cut the thread of M6. The mud guard stay of the lander is 5 mm. Satisfactory mud guard stay completed by hand-drilling this aluminum round bar without purchasing ready-made items. There is neither possible nor impossible. The price is higher than Akihabara, but you can save the trouble of going to buy.